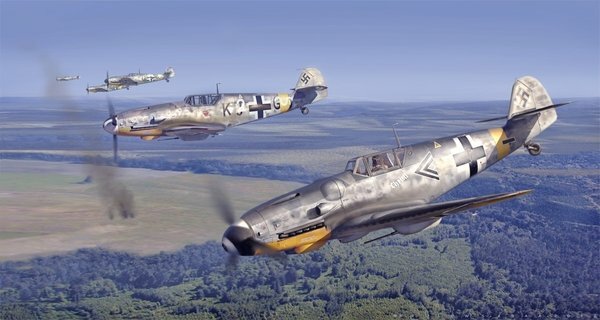 Jagdgeschwader 52 (JG 52), was the most successful Luftwaffe fighter wing and the highest-scoring fighter organization in the history of human conflict, claiming an aggregate total of more than 10,000 aerial victories over enemy aircraft during the Second World War. The top three scoring aces of all time, Gerhard Barkhorn, Erich Hartmann, and Gunther Rall are seen closest to the viewer in the picture. Additionally two more of history's highest scorers who were also JG 52 alumni are seen beyond the first three - Macky Steinhoff and Hermann Graf. Jagdgeschwader 52 operated nearly all versions of the Messerschmitt Bf 109 during the war.